Another prominent symbol of female ambition put forward this year is a statue of an elementary-school student: the bronze “Fearless Girl” staring down the famous bull on Wall Street. 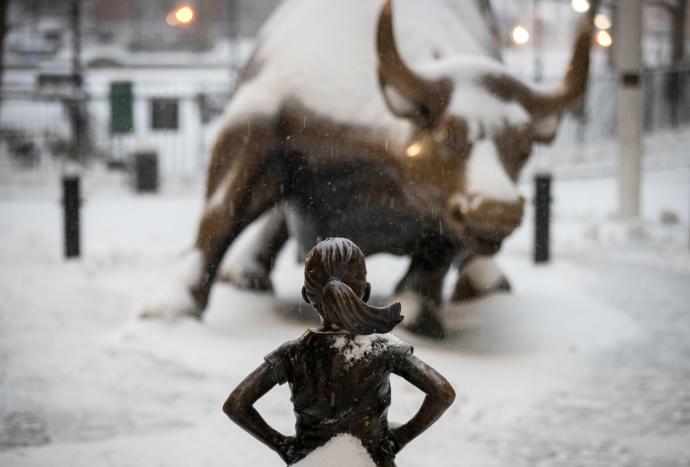 The statue was conceived by an advertising agency for an investment firm whose twenty-eight-person leadership team contains five women; according to the sculptor, Kristen Visbal, the statue “reminds us today’s working woman is here to stay.” It’s dismaying, and revealing, that this message is most easily conveyed through a figure of a girl—her skirt and ponytail blown back in the breeze, cheerfully unaware of the strained, exhausted, overdetermined future that awaits her. Enfin quelqu’un relève le problème avec cette statue!